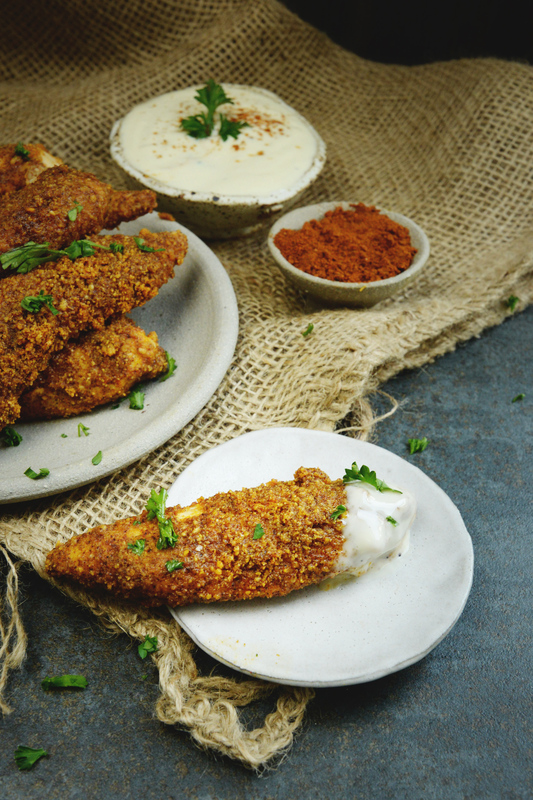 These easy Low-Carb Buffalo Chicken Tenders boast a crunchy, spicy coating. These mouthwatering morsels can be part of a low-carb, keto, Atkins, gluten-free, or Banting diet. Looking for something to serve on game day? Look no further! 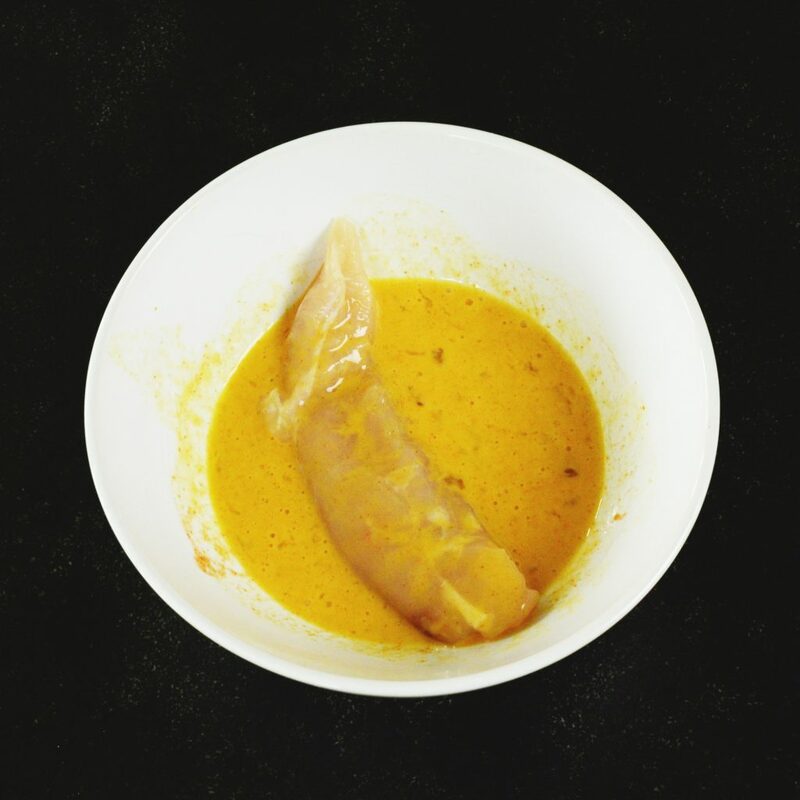 This recipe layers on spiciness! First the tenders take a swim in a hot sauce and egg mixture. Next, they roll in a mixture of almond flour, parmesan mixture with spices like garlic, chili powder, and cayenne. Finally, they bake to golden perfection. Baking adds crunch to the coating without the mess and greasiness of frying, or the expense of an air fryer. Bite through that spicy coating to enjoy moist, tender chicken. 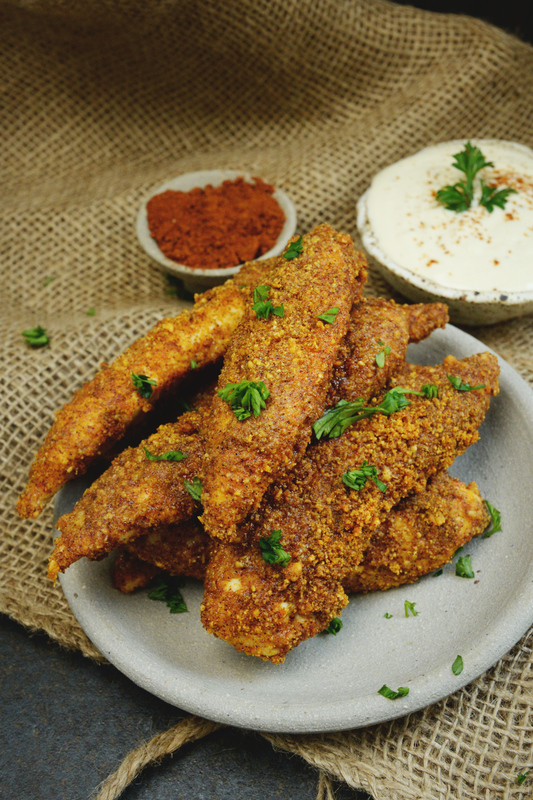 These chicken tenders were inspired by buffalo chicken wings on the menu of every restaurant! I love buffalo chicken wings, but, hey, sometimes I’m just too lazy to eat around all of those bones. Sometimes, I get inspiration without even realizing it. I think these chicken tenders from Step Away from the Carbs found a place in the back of my mind and may have contributed to my craving for fried chicken. I mean, how can one not dream about those? If you don’t have chicken tenders, you could easily use chicken breasts in this recipe. Simply cut them into strips that are about the same size as chicken tenders. You can also use this recipe to make smaller, bite-sized pieces. You may need to adjust the baking time, however. The smaller the piece, the faster they will bake. 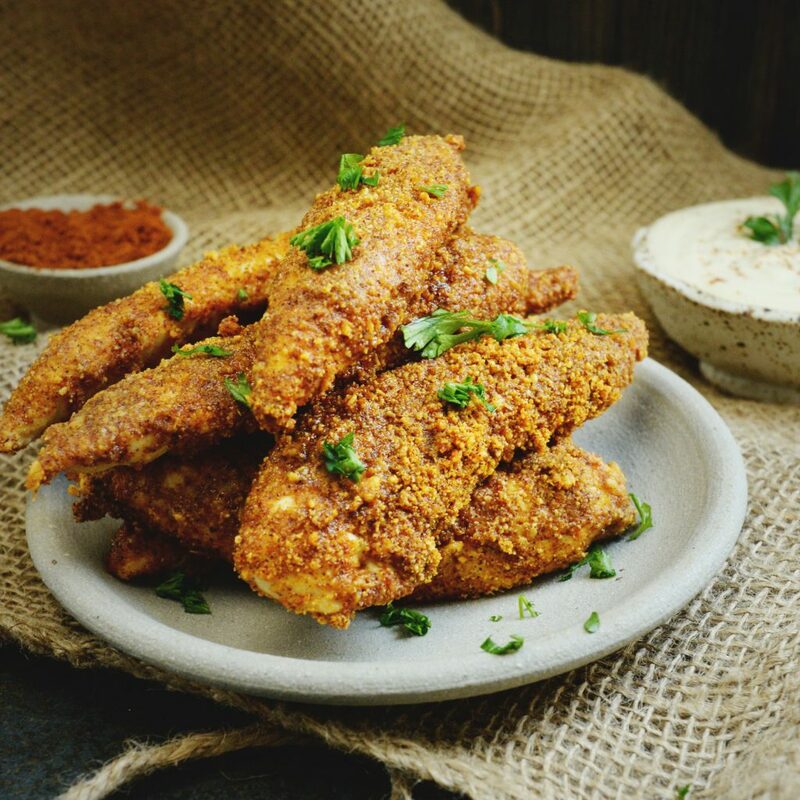 If you follow this recipe exactly, I would describe the heat-level of these low-carb Buffalo Chicken Tenders as medium-high. You can adjust the heat level by increasing or decreasing the amount of hot sauce in the egg mixture, or the amount of cayenne pepper in the cheese mixture. These chicken tenders make an easy appetizer for game day, but are filling enough to use as a whole meal. Serve them up with some stalks of celery and a bowl of your favorite ranch or my blue cheese dressing to complement their spiciness. Enjoy! Preheat oven to 400º Fahrenheit. Prepare a broiling pan with a rack by wiping with coconut oil or other oil of preference. A baking tray with a rack may be used as well. 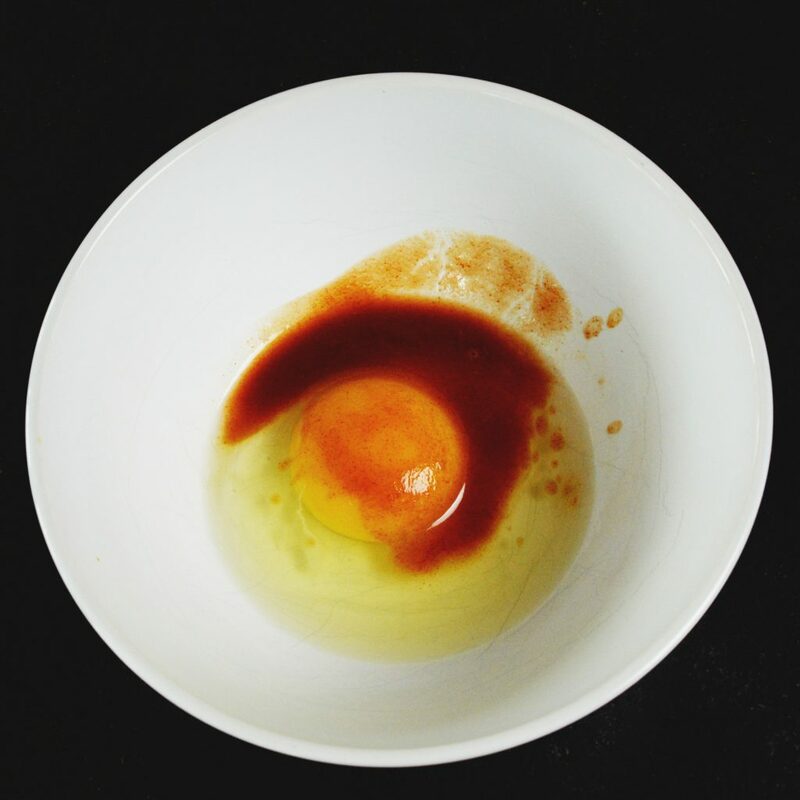 In a small mixing bowl, whisk together the egg and the hot sauce. Set aside. 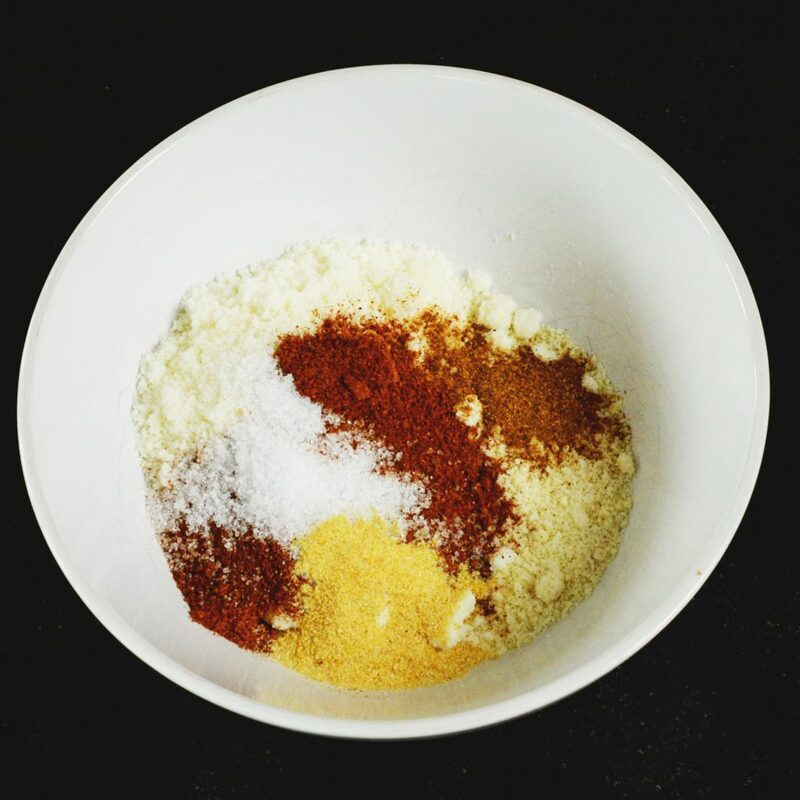 In a second small mixing bowl, whisk together the pecorino romano, almond flour, chili powder, cayenne pepper, garlic powder, and sea salt. One by one, dip the chicken strips in the egg mixture. Turn to coat. 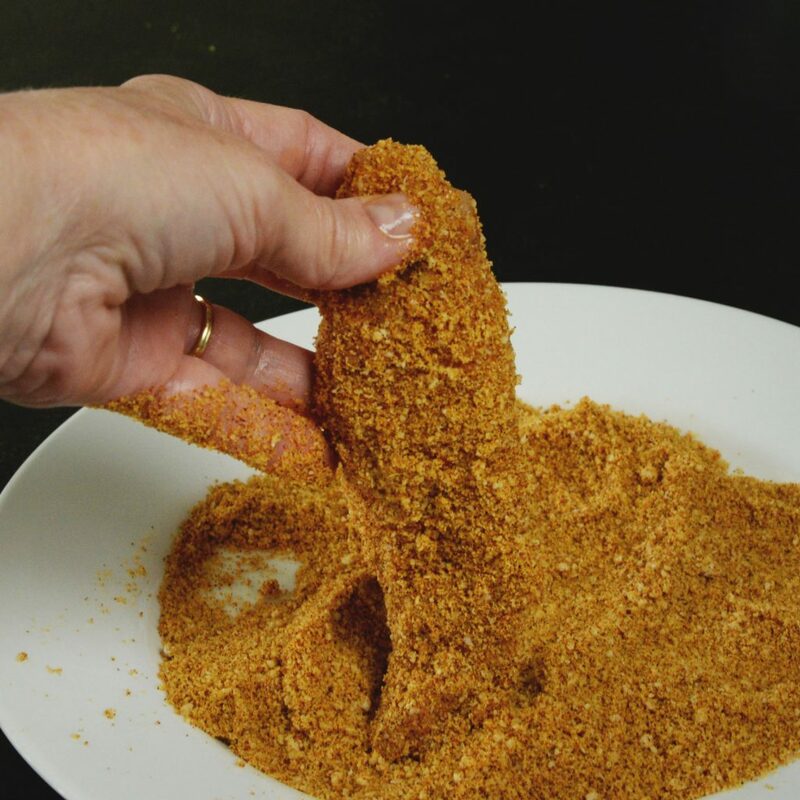 Then, dip the egg coated strip in the spicy coating, turning to coat and pressing down slightly if necessary. 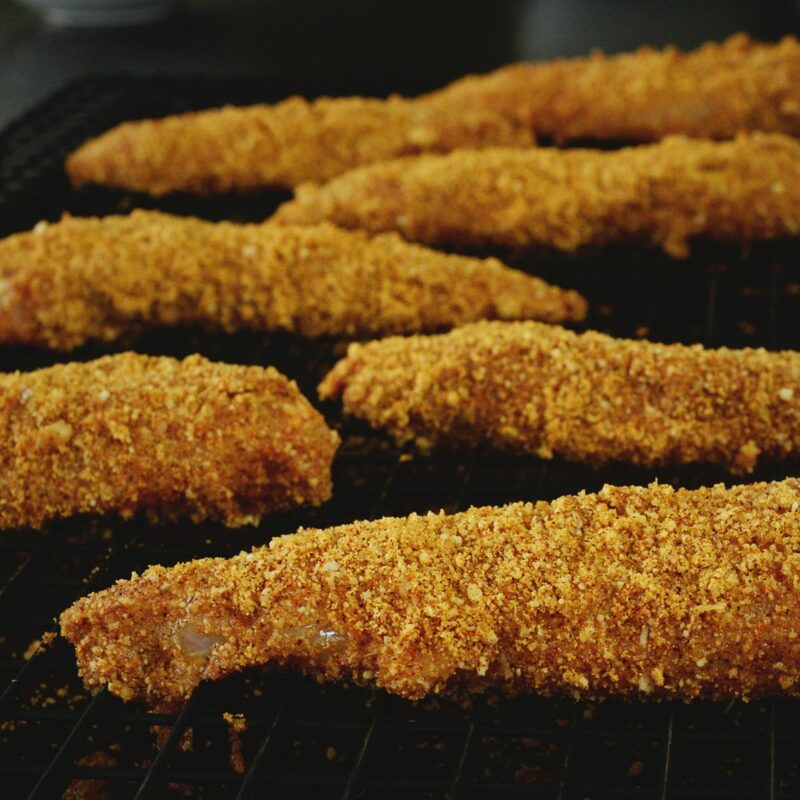 Place coated chicken strip on the prepared baking tray. Repeat for the rest of the strips. Bake the strips in the top third of the preheated oven for about 20 minutes, or until the internal temperature reaches 165º Fahrenheit. Turn the oven to the broil setting. Broil the chicken for 1-3 minutes or until the coating turns golden and crispy. These would be a hit for Super Bowl! 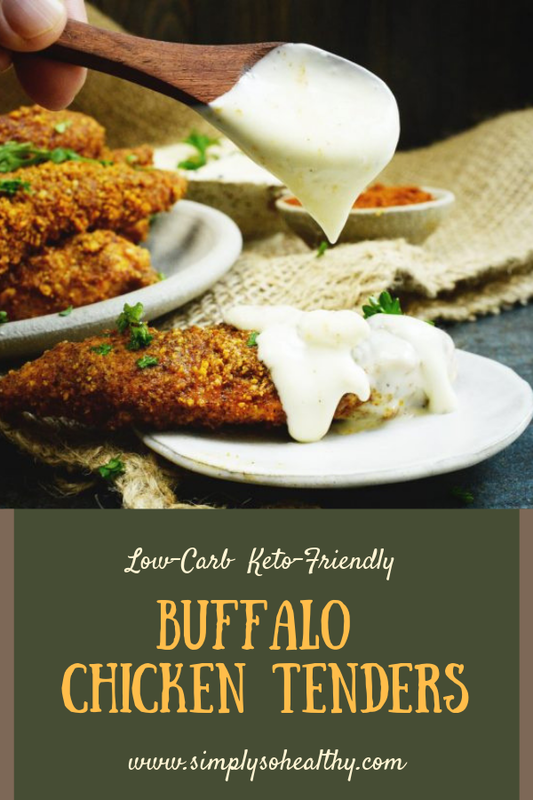 Love that they have a spicy coating and bonus….LOW CARB! Great recipe! Thanks so much! They’re on my Super Bowl menu for sure! 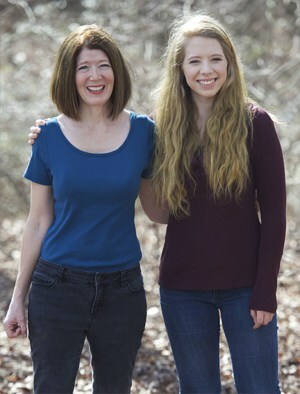 These were so easy to make and everyone loved them – thank you! Glad they enjoyed them! You’re welcome! These tenders are going to go down next week! Adding to my menu now. 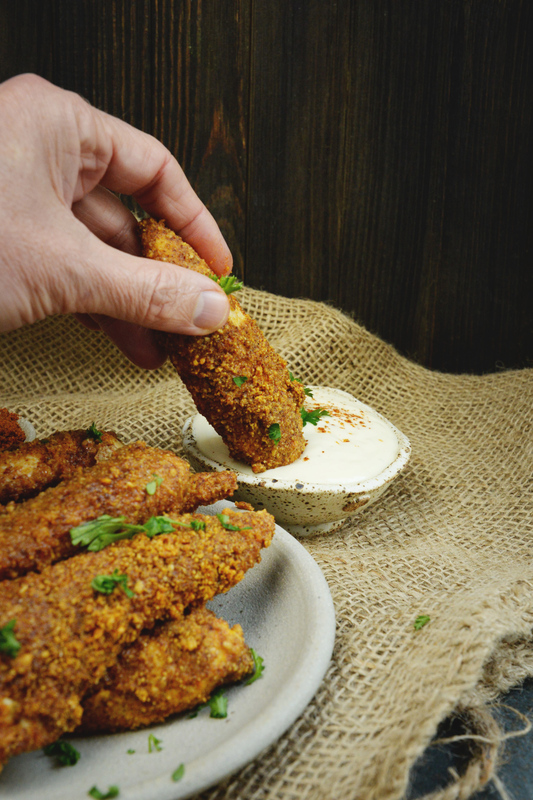 I love the idea of adult-version chicken fingers! Much tidier than chicken wings for game day! Right?! No bones to deal with. Wow, these chicken tenders look so crunchy and perfectly seasoned I want some! Love the idea of adding pecorino romano to the mix. These look super crunchy and super delicious. I know my family would love these for dinner any night of the week. Perfect as a party appetizer too. Yep. They are on my menu for game day! These chicken tenders look so crispy, I thought they were fried! I need to try your low carb version, they look mouthwatering. I’ll have to pin this for later! What a great idea to use almond flour in a batter. I never thought of that, genius! These are perfect for game day on any day, they look fabulous and easy, just perfect for me. Thanks for sharing this. What great appetizers and munchy food. I love the idea of low-carb. There is nothing better than appetizers – makes me happy and I could make an entire meal just out of finger foods. The chicken tenders will be perfect for our game party. This is the recipe I’ve been searching for to get that spicy buffalo chicken kick without the guilt of fried wings and butter-hot sauce. 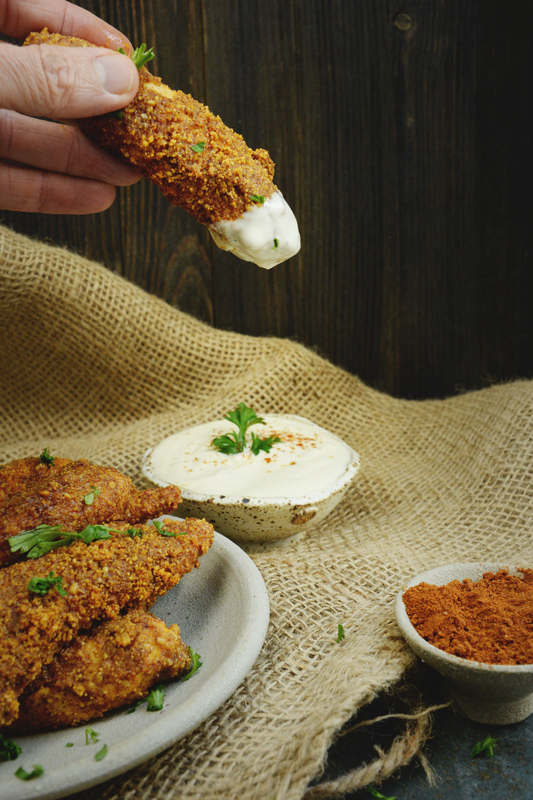 We are planning our big game menu and rest assured, these Buffalo chicken tenders have made the cut. Can I assume that’s a blue cheese dressing you’re dipping it in? Blue cheese dressing, for sure. Ranch is also a great choice. Totally agree that wings can get annoying. I’m all for the tenders. I love that you used almond flour. I bet that gives them more flavor the regular flour. It does add some flavor. It also keeps them low-carb and gluten free. 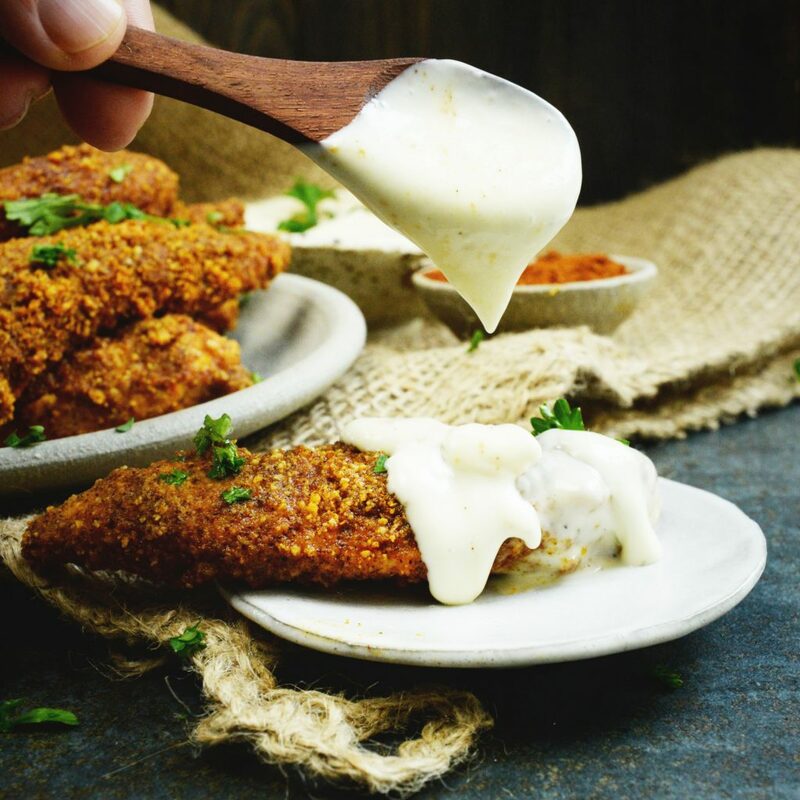 Yes, blue cheese or ranch dressing makes a perfect dipping sauce to cool the heat! I grew up about 30 minutes outside of Buffalo (on the Canadian side) therefore grew up on true Buffalo goodness. To this day, I can’t get enough of it. I love it with wings like most purists, but I’m also a huge fan of Buffalo chicken tenders! It’s nice to get all of that fiery vinegary flavor into your mouth in a few big bites and not have to worry about working around any bones. Haha. I really need to make these! I live in North Carolina now, and finding good Buffalo anything is tough. I had no idea that was where the term buffalo came from! Ooooh I’m such a sucker for buffalo sauce. It’s just so spicy and vinegary. YUM! I’m kind of obsessed with trying that almond flour parmesan crust too. Gotta try these! Love the seasonings, love the almond flour…love everything about these! I’m crazy for buffalo flavored anything, so, winning all around! Thanks for the tasty recipe! OOH…my guests are going to like everything about this on Sunday. Spicy, crunchy (without the breadcrumbs!! ), tasty. 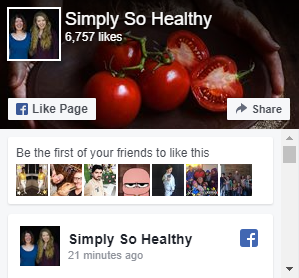 AND, I’m going to like how easy they are to make, and a healthy alternative too. I will definitely add these to the super bowl menu. They work for everyone! Have a great party! So looking forward to making these! I’d actually love to use my air fryer for these. Have you tried that? Is there a downside? I don’t have an air fryer so I can’t really give you any help on this one. It sounds like they would be amazing cooked this way, but I have absolutely no air fryer experience.